1) Blend your shake, soup, etc. 2) Pour the shake out into a cup. 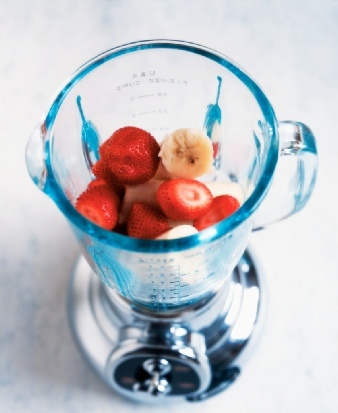 3) Rinse out the blender and the top of the blender in the sink, just to remove the largest particles. Run your hand around the top edge of the blender pitcher, as this is the place where dry bits of shake powder tend to congregate. 4) Fill the pitcher between 1/2 and 1/4 full of water, and add a couple of drops of dishwashing soup. 5) Put the top back on, and place it on the blender. 6) Blend on the highest setting. Feel free to switch between low and high settings to get the water to really agitate inside the blender. 7) Turn the blender off, remove from base, and rinse it out in the sink again. It should be sparkling clean. Make your own judgment on when to run the washable portions of the blender through your dishwasher, if you’ve got one. I normally run mine through the dishwasher once or twice a week, depending on what I’ve blended in it. Otherwise, you should be good to go. I normally set up a dishtowel on the counter and dry my blender pitcher and lid upside down while I’m at work. It’s clean and dry in time for making other blended items at night if I wish. So easy that it drives me crazy I didn’t think of it 10 years ago!